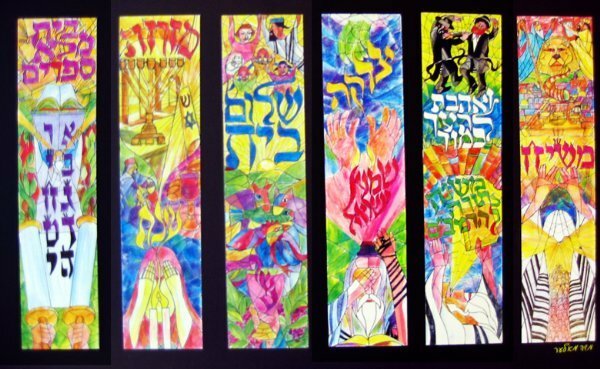 An exciting new addition to the Chabad Community Center of Monroe will be six beautiful custom stained glass windows, designed exclusively for the center by Moshe (Maurice) Mahler of Monroe Twp. Each of the windows depicts two Mitzvahs that are near and dear to the Lubavitcher Rebbe, and one window dedicated to Moshiach. Window 1 top: Torah books in every home. Window 1 bottom: Learn Torah especially with the young / Every child should have a letter written for them in a Sefer Torah. Window 2 top: A Kosher Mezuzah for every door. Window 2 bottom: Every woman and girl should light Shabbos candles every Friday before sunset and before Jewish holidays. Window 3 top: Keep the laws of family purity and maintain the sanctity of a Jewish home. Window 3 bottom: Keep Kosher. Window 4 top: Give charity every day (except on Shabbos and Yom Tov). Window 4 bottom: Men and boys over Bar Mitzvah should put on Tefillin every day (except on Shabbos and Yom Tov). Window 5 top: Love your fellow Jew – It is the basis for the whole Torah. Window 5 bottom: Study a portion of the Rambam (Maimonides) daily. Window 6: Prepare the world for the coming of Moshiach and the building of the third Beis Hamikdash (temple) by increasing in acts of goodness and kindness.